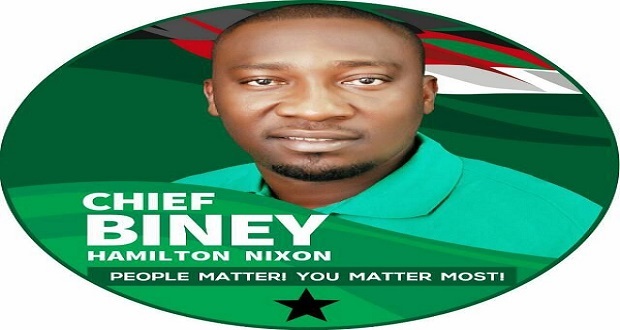 An aspiring National Democratic Congress (NDC) Deputy National Organiser, Chief Hamilton Biney Nixon has taken a swipe at government for allegedly distributing expired fertilizers to cocoa farmers in the Western Region. Chief Biney, who is touring the country to seek for the mandate of delegates ahead of the NDC’s national elections, noted that the said fertilizers will expire in a couple of weeks. “The fertilizers will will expire in next two weeks and they are giving them to the farmers for free,” he disclosed to Kaakyire Kwesi Appea-Appraku on Power FM’s Dwaboase on Tuesday. “One thing that surprises me is that the fertilizers given to the farmers for free will need about 3 months to work perfectly when applied to their cocoa trees on their farms,” he said. He said the areas the fertilizers are being shared are the Sefwi Wiawso, Bia East and Bia West areas in the Western Region, and Diaso in the Central Region. Asked how he realized the fertilizers were almost expiring, Chief Biney said not only had he personally seen them, but the farmers were also against the decision of Agric officers to distribute them to them. According to him, cocoa farmers in the Western Region are angry about the issue and are also up against the government for giving them free fertilizers that will not give them any value on their farms. Calling on investigative bodies to take up the matter and get those behind the act to face the laws, Mr Nixon said the Akufo-Addo government cares less about Agriculture in general and the plights of farmers hence it will not be surprising if the distribution was sanctioned by the Agric Ministry, knowing very well they were to be expired in November. “According to the farmers, the fertilizers are expected to ensure food security and also help them get appreciable returns on their investments but these free fertizers which will expire in November 2018 will not help the farmers,” he noted. The Ministry of Agriculture has not yet responded to the allegations of the NDC communicator.